As you age, you’ll find that restorative dental treatments can significantly improve your overall oral health. Whether you are trying to cover unsightly cracks and discoloration in your smile, or your looking to rebuild your smile altogether; dental crowns play a huge role in the process. Eventually, your dentist in Waco may want to recommend a dental crown in your next treatment plan. If you aren’t sure what that means or how crowns can benefit you, keep reading. A dental crown is tooth-shaped cover or “cap” that is placed on top of preexisting teeth. When cemented into place, crowns are meant to fully encase the visible portion of your current tooth that lies above and at the gum line. 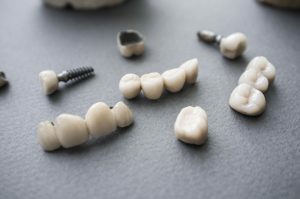 Dental crowns are usually made from all-ceramic material as it’s the closest matching color to natural teeth, however, they can also be made from white or yellow dental gold. This material is known for being incredibly resilient and resistant to your jaw’s incredible biting forces, making it more ideal for less visible teeth and areas where these is little space for the bite. The list goes on. Thanks to new technology, dentists are actually capable of producing custom-made crowns in an incredibly short period of time. This is also why your dentist in Waco may want to include crowns in your treatment plan. CEREC stands for Chairside Economical Restoration of Esthetic Ceramics. This technology uses 3D photography and CAD/CAM technology to help dentists design a virtual restoration without taking impressions. This data is then transferred to a milling machine that forms your new crown the same day you visit. Furthermore, CEREC in Waco allows dentists to produce a crown in-office quickly, usually in under 2 hours. This makes it incredibly convenient for a dentist to solve any dental issues you may have, including emergencies that require a temporary crown to fix. To prevent future problems from arising, especially for serious forms of tooth decay, a dental crown may prove to be your best treatment option. Don’t let the unknown stop you from getting the oral care you deserve. Consider dental crowns in Waco today! Premier Family Dental carries a team of highly-trained dental hygienists ready to provide you with the highest quality care possible. Our office understands preventive as well as restorative treatments inside and out, so you can rest knowing you’re in good hands. If you’re determining if composite fillings and/or dental crowns are the right option for your dental issue and would like to learn more, contact us at (254) 732-0309 or visit our website.